The history of the Fairchild Airplane Manufacturing Company was set out in the review of the Pavla 1/72 Fairchild F-24 in the August 2001 issue of this magazine and will not, therefore, be repeated here. Sherman Fairchild's first airplane the FC-1 was built in 1926 specifically to carry Fairchild Automatic Aerial cameras for photo surveying. Demonstrations of the FC-1 and its performance in the 2,600 mile 1926 Ford Reliability Tour stirred much interest. The FC-1's original 90 hp Curtiss OX-5 engine was soon replaced with a 200 hp Wright J-4 Whirlwind and, with other changes to facilitate broader applications, became the FC-2. The first FC-2, c/n 2, gained a lot of good press for Fairchild when its buyer, the US Department of Commerce, assigned it to accompany Charles A. Lindbergh on his 23,000 mile triumphal tour of the 48 US states in 1927. Modified to mount the 300 hp Wright J-6-9, the FC-2 became the Model 51. By the end of 1928 Fairchild had built 162 airplanes; pretty good for a startup during the depression! With a switch to the 400 hp P & W Wasp and the addition of six feet to the wingspan and two feet to the length, the Model 51 became the Model 61. Fairchild model numbers were a confusing muddle. Suffice to say the F.71 is most like its immediate predecessor the FC-2W2, one of which was Commander Richard Byrd's colorful orange and blue "Stars and Stripes" used on his 1929 Antarctic expedition. The conversion of this kit from an F.71 to a FC-2W2 is quite simple. Farichild's smaller, four-place, Model 41 followed. Only eight of these were built for private and executive use. The Model 71 was the ultimate development of the FC-1 configuration. The quick I.D. features of this seven-place design, to distinguish it from the very similar FC-2W2, are the curved rear cabin windows and radiused upper corners of the fuselage. 117 Model 71's were built by the end of production in 1931. Seven went to Canada's Department of National Defense, 14 to the US Army and one to the US Navy; the rest were sold to civilian operators. The FC-2 designation system overlaid the simpler Model numbering system for many years and causes a lot of confusion - so be careful with your research on these airplanes. This is the first kit from Khee Kha Art Products and, I suspect, it is also the first kit manufactured in Alaska. The kit's designer, and Khee Kha's owner, is Lars Opland who made his own drawings for the Model 71 as he could find none in the published sources available to him. The kit comes in a resealable plastic bag containing: one 8" x 10" sheet of .040" white polystyrene with 26 vac-formed parts for your consideration; a smaller bag containing the beautifully cast resin engine, propeller and left and right exhaust manifolds along with a vac-formed clear, three panel, windscreen; a 3/4" x 3" sheet of clear styrene for the side windows and - the pièce de résistance - nine pages of well illustrated instructions printed on 8 1/2" x 11" paper. No decals are included. 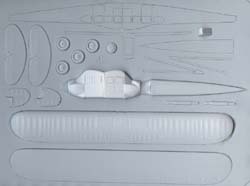 The vac-forming was done into a female mold so the detail is quite good, especially as it relates to the wing ribs. Lars' approach to the fuselage is different from any I've ever seen. 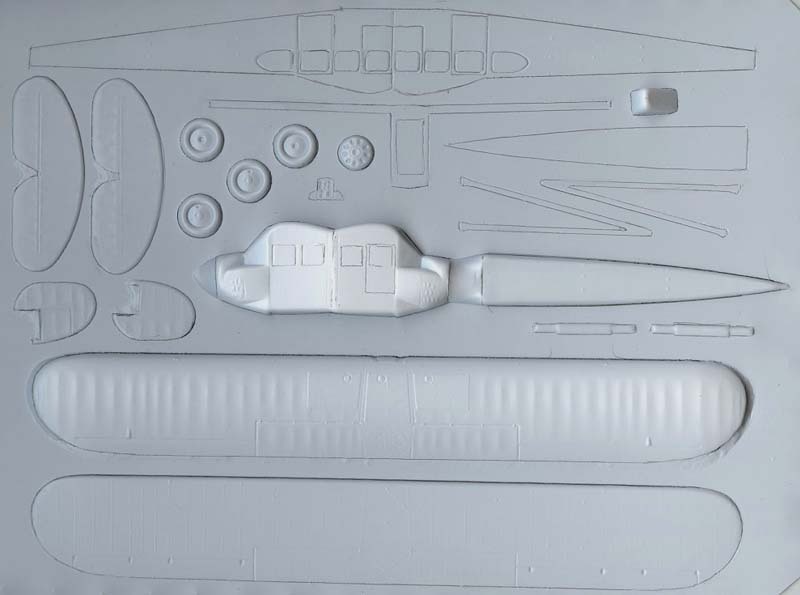 The forward fuselage, back to the second window, is vac-formed in conventional halves; from that point aft the fuselage is built up of separate vac-formed sides, a flat bottom and vac-formed top. It's a bit complex but it sure looks like a good solution to the shape problem. I would ignore the wing and landing gear struts provided and use Contrail, Strutz, wood or brass substitutes. I think I'd also be inclined to use the clear Scotch Tape windows technique, set out in the Fairchild F-24 review in the August 2001 issue of this magazine, for the side windows. The instructions are superb and take you step-by-careful-step through the building of this model. They are a little soft on colors and markings though, giving only two schemes; one for a Reeves Airways red, yellow and black airplane and another for a standard Fairchild factory scheme of dark red (Burgundy) and very pale cream. A color photo, from the first reference below, of this scheme is reproduced at the top of the page. Note that the red atop the wing is not scalloped as Lars speculates but carries over the wing's leading edge, top and bottom, about six scale inches and sharply radiuses into the width of the fuselage across the top of the wing center section. 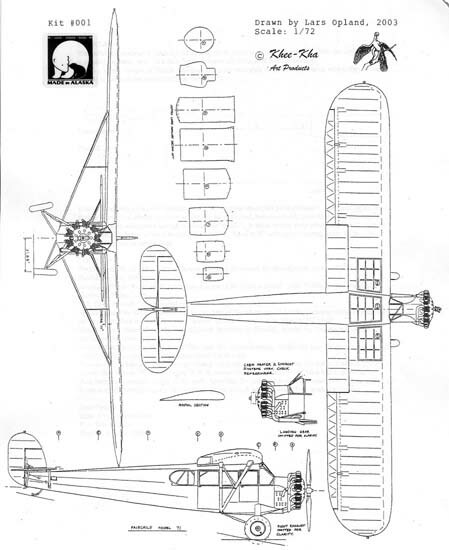 Details of Byrd's FC-2W2 "Stars and Stripes" are given in the Paul Matt drawings in the second reference below. The instructions include Lars' excellent 1/72 general arrangement drawing of the F.71. This is a fine and very welcome kit of an important civil subject. It is definitely not an easy build but the end product is worth the effort. A big thank you and bags of kudos to Lars for his first kit. 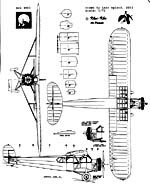 A small note included with this kit shows a side-elevation drawing announcing the next kit will be the Bellanca Skyrocket high wing monoplane with typically broad-chord Bellanca wing struts. 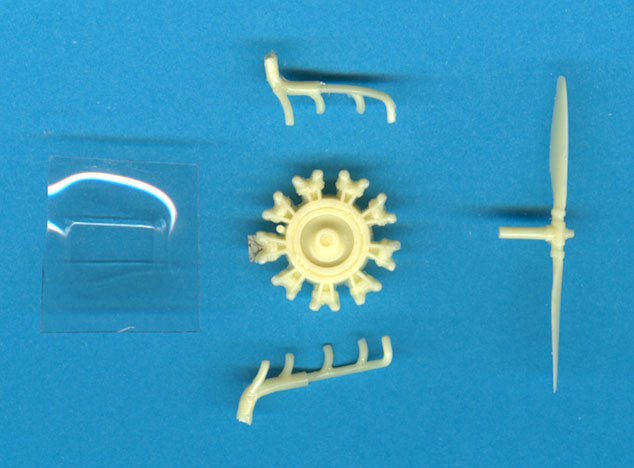 The kit is available directly from the manufacturer for $ 20 plus $5 postage; the $5 is good for up to three kits. Fairchild Aircraft 1926-1987: Narkiewicz & Thompson, Narkiewicz/Thompson Publictions, USA, 1997, ISBN 0-913322-04-0. Paul Matt's Scale Aircraft Drawings - Volume 1: Sunshine House, Inc., USA, 1991 & 1992, ISBN 0-943691-04-4. Flying Beats Work - The story of Reeve Aleutian Airways: Stan Cohen, Pictorial History Publications, 1998. Alaskan Wings - Aviation in Southeast Alaska - the Golden Years: Jim Ruotsala, Seadrome Press, 2002. US Civil Aircraft, Volume 1: Joseph Juptner, 1962. If you have any other FC-2W2/F.71 information - especially colors and markings - please let me know.